A good sale for nonstop service Australia. One Response to "Air Canada – C$1,016: Vancouver – Sydney, Australia. 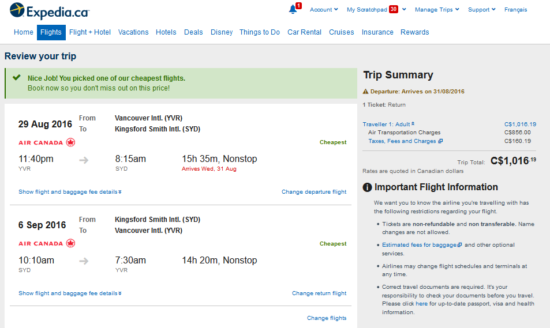 Roundtrip, including all Taxes"
There’s also a similar price and a cheaper price (around $970) for AKL from YVR via NZ. It has to get priced on Momondo though seemingly then one of the OTAs will sell it at that price while ITA won’t price it that low. Worth a look, time frame stretches into May as well.